Sense Sidekik Replacement Cartridge BundleThis cartridge bundle not only includes a 2mL replacement .. Sense Sidekik 5pk CoilsReplacement coils for the Sidekik Pod Kit from Sense with a resistance of 1.1.. Sense Screen Mesh 3pk CoilsReplacement Mesh Coils for the Screen Mesh Tank by Sense. All made out of.. Sense Herakles III 25 MESH Tank***COMPATIBLE WITH SENSE V-JET & MESH COILS***The Sense .. Sense Arrow Mesh 0.15 Ohm 5pk CoilsPack Of 5 Mesh Coils0.15 OhmMaterial: KanthalJapanese Organic Cot..
Arrow Classic 230W KIT by SenseARROW Tank: 6ML Juice CapacityARROW Mod: 52.50mm*93.00mm (Battery: Du.. 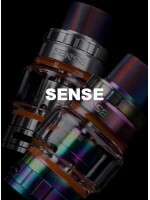 Sense Herakles III 24 Sub-Ohm Tank***COMPATIBLE WITH SENSE V-JET COILS***A spectacular update to one..
V-Jet Coils 5 PackPack of 5 Coils.2 ohm Coil40 to 100WStainless Steel 316LJapanese Cotton.4 ohm Coil..
V-Jet Replacement Glass by SenseV-Jet Replacement Glass by Sense for use with the V-Jet Tanks..
V-Jet Tank by senseV-JET Tank: 24.8mm(D)*58.5mm(H)4.5ML Juice CapacitDerlin Drip TipFlip Hinged..
V-Jet Kit by senseV-JET Tank: 24.8mm(D)*58.5mm(H)4.5ML Juice CapacitDerlin Drip TipFlip Hinged ..
Blazer Nano 5pk Coils by Sense The Sense Blazer Nano Replacement Coil Technology provides excep..
Blazer Nano Tank by SenseThe Sense Blazer Nano Flavor Tank continues the storied Blazer series from ..
Blazer PRO Coils (3pk) by SenseThe 0.3 ohm Blazer PRO coils are a unique design combining dual verti..